Travellers returning from bank holiday trips faced delays as heavy rain and snow closed roads. 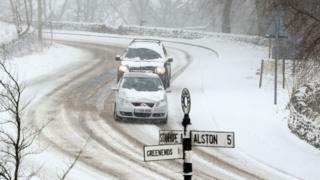 Up to 4in (10cm) of snow covered parts of Scotland, northern England and north Wales, while torrential rain fell in southern England. Flood warnings and alerts are in force in England, Scotland and Wales. 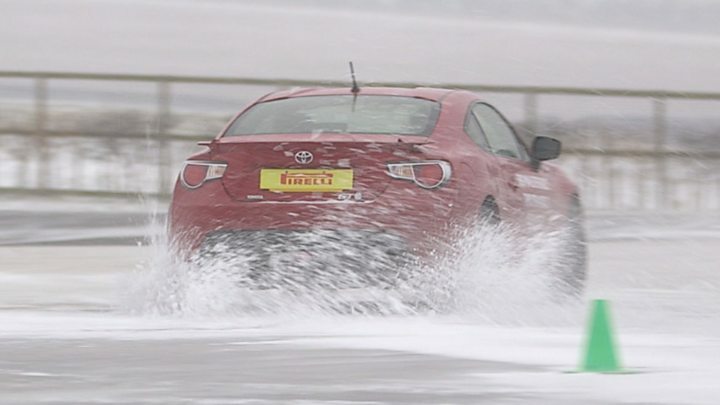 The Met Office has issued yellow weather warnings as the AA warns that motorists faced one of the busiest bank holidays on the roads in recent years. As of 21:00 BST the Environment Agency had issued 41 flood warnings and 217 flood alerts in England, and the Scottish Environment Protection Agency issued one flood warning for people in Scotland. Natural Resources Wales had one flood warning and 19 flood alerts in place for Wales. BBC Weather presenter Nick Miller said: "It will be a chilly night to come in Scotland with further sleet and snow - we could well see some significant accumulations in the Highlands. "Elsewhere we'll get some clear spells with some showers around. Some of those could be on the heavy side, particularly into England and Wales where it will be a mild night. But you'll see in northern England, northern Ireland and Scotland, temperatures are still struggling." The A616 in South Yorkshire in both directions between A628 (Hazelhead) and A6102 (Deepcar). The A628 Woodhead Pass in both directions due to snowy weather conditions between the A616 and A57. Four roads in Derbyshire: The A53 at Axe Edge, A54/A537 at the Cat and Fiddle, A57 Snake Pass and the A6024 at Holme Moss. The A14 westbound exit slip at Junction 28 near Cambridge owing to flooding. Police also warned of localised flooding, advising motorists to avoid deeper water. According to the Met Office, snow in spring is not as unusual it might seem: the average between 1981 and 2010 was for 2.3 days of snowfall in April - more than in November. Easter Monday sporting fixtures were hit by cancellations, as waterlogged pitches caused the postponement of Nottingham Forest's Championship clash against Barnsley, along with several lower-league matches. Horse racing meetings at Market Rasen, Fakenham, Plumpton, Chepstow and Redcar were also abandoned due to heavy rain. The weather was also blamed for a sharp fall in visits to the High Street.